For all versions of DAS, there is no battery required for the key. The battery in the key fob is used only to power the RCL (Remote Control Locking) functions. The power for the DAS functions comes from an electronic coil mounted in the ignition switch housing that supplies inductive current to the circuitry in the key fob. Thanks for that interesting information loubapache. Can you identify the two small black oblong units attached to my key-fobs? These are the keys to my 1998 SL500 which I bought last year. The previous owner said to be sure they were near the the ignition lock ring when starting. I can only assume they are DAS related? I position 2 I have to wait for a faint bleep before firing up the engine. There are in fact two bleeps one loud and the fainter bleep, the car will not start until the faint bleep is heard. Sorry, RedLiner, I do not have experience with that key. 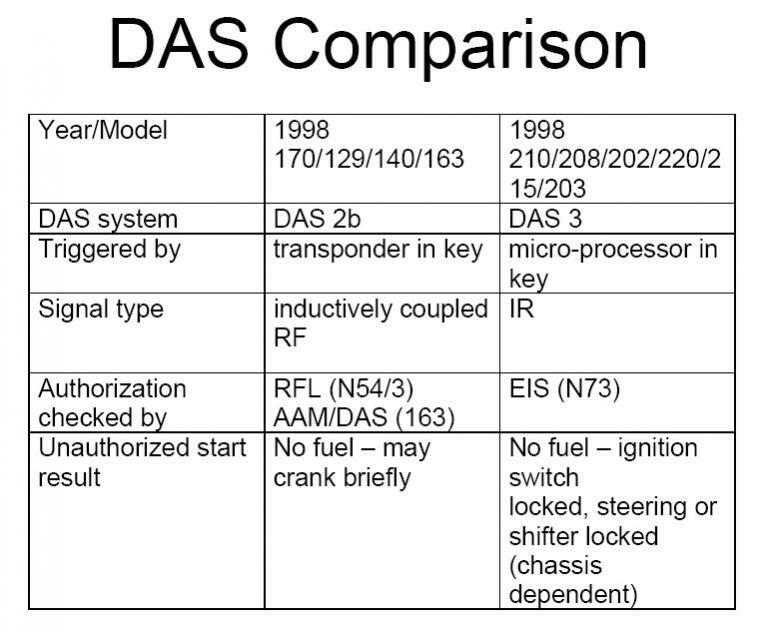 It seems your car uses a DAS 2b system and here is a page from Mercedes about it. The black oblong bits are part of an anti theft device. Behind the dash and normally in the area of the ignition unit is a small pick up that receives a signal from the oblong object. If you get into your car with the key and leave the oblong unit at home your car will not start. All Mercedes-Benz vehicles manufactured in about the last dozen years use DAS (Drive Authorization System) to electronically validate the vehicle's key. Each key fob for this system contains an EEPROM chip that stores a fixed serial number and a rolling code. Each time the key is used in the ignition switch, DAS reads both the fixed serial number and the rolling code. These values are compared to known valid values stored in DAS. If a match is found, the ECM (Engine Control Module) will allow the engine to start and run, and DAS will write a new randomized rolling code to the key fob's EEPROM. If the key fails validation, even if it is mechanically able to turn the ignition switch, the ECM will prevent the engine form running. Every Mercedes-Benz vehicle has a record in FDOK (The Mercedes worldwide database that contains all information about ever Mercedes ever built). When the record is created for a new vehicle, a set of unique key serial numbers is assigned and stored in FDOK. Only certain authorized employees at authorized PDC's (Parts Distribution Center) have access to this information. Authorized PDC's stock virgin key transponders and have special equipment to program them with valid serial numbers from FDOK. Keys are programmed when key set is ordered for a new vehicle or an additional or replacement key is ordered for an existing vehicle. Only a factory or an authorized service center can order keys. For existing vehicles, the service center is required to verify that the customer ordering a key is in fact the owner of the vehicle in question. Examining the customer's photo ID and the vehicle's registration receipt generally satisfies this. For new factory vehicles, there is an operation that performs the initial programming of DAS to introduce it to its assigned key set. This loads all the pre-defined key serial numbers into DAS as defined in FDOK. Even though not all keys physically exist, all possible key ID's for that vehicle are loaded. This is performed in different ways depending on which version of DAS the vehicle uses. Once performed, there is a marriage process that irreversibly locks this data into DAS. Once married to a key set, DAS will only recognize keys in that set. Officially, there is no way to reverse this process and introduce a new key set to DAS, nor is there a way to alter any of the individual key ID's known to DAS. There are two versions of DAS: version 2 and 3. Version 2 generally uses the rectangular fob and a mechanical switchblade to operate the ignition switch. Version 3 almost exclusively uses a tapered fob key with an infrared interface and has no metal blade for the ignition switch. The main difference between DAS 2 and DAS 3 is in the way the key is validated. With DAS 2, the key is validated only by the DAS/AAM module (All-Activity Module), which in turn sends an OK to Start signal to the ECM via the CAN. With DAS 3, the key's ID is actually transmitted over the CAN where the ECM validates it. With DAS 2, there is a maximum of 8 unique keys per vehicle. 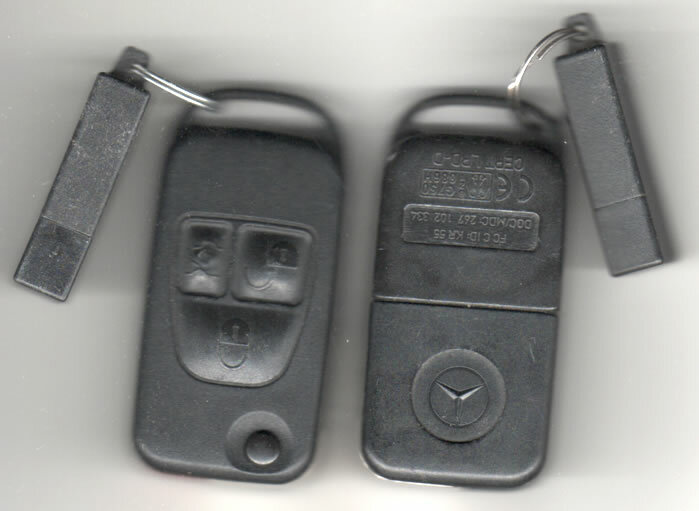 These key ID's are programmed into a virgin DAS/AAM module at the factory using the valet key, also known as the One-Way Master. This master key is programmed at the PDC with all eight pre-defined key numbers as assigned to the vehicle in FDOK. At the factory, the master is used along with the HHT (Hand Held Tester) to initiate the download of these ID's. Once the download has taken place, the key set can be married to DAS either by a function on the HHT or after 50 engine starts. The one-way master then becomes one of the valid 8 key numbers and is designated as the valet key. Other than lacking the RCL functions, the valet key has the same EEPROM and programmable rolling code functions as the rectangular fob keys. When a new key is requested, either because one is lost or the customer desires an additional spare key, it is ordered from the PDC where it is created with the next unused key number according to FDOK. If the key is a replacement for a lost key, the service center technician will disable the key number of the missing key. This can be done as either a reversible or irreversible process. This has no effect on the RCL function; it's programming is handled separately within the AAM. This means that it is possible to have a key that can function for RCL, but not start the engine. Once all eight key numbers have been created by the PDC, any additional keys would require replacement of the DAS module and the creation of an entirely new key set from the PDC. With DAS 3, there is a maximum of 24 keys per vehicle, however only 8 can be active at a time. Basically, DAS 3 has the same 8 key numbers as DAS 2, but for each key number, there are three key segments. The valid key numbers and segments are programmed into the virgin ESL (Electronic Steering Lock), EIS (Electronic Ignition Switch) and ECM using a special green-colored workshop key. As delivered, the vehicle will have two keys using key number 1, segment 1 and key number 2, segment 1. Some models were delivered with three keys, the third one bing a reserved key with no battery in it. It can only be used to start the car or open the door with the mechanical key. When a new key is ordered, the PDC determines which key number and segment to supply based on whether the key is a replacement for a lost one or and additional spare key. Nice post! It is a good information. I have a 2002 clk320 and need one more key. Can someone tell me if this one will work if I buy it from this guy? It looks exactly like mine. The dealer said they do not do any programming for clk keys when they received them from MB. Locksmith is gonna be the cheapest. I don't understand why you don't want a locksmith to do it. you want a dealer to do it? they are going to charge you way more than a locksmith. you should figure that means though most every part from a dealer is more expensive than other aftermarket places. and changing all your locks? that would be uber expensive and pointless. even considering changing all the locks is a dumb idea when you can call Plainfield Locksmith, prove its your car, and boom, 1 key that's the exact same as the one you lost. Last edited by timcooper; 05-21-2016 at 01:07 AM. Just had my local locksmith cut 2 Lexus blanks for my c230. These are keys with a full head on them which I want to use to open the doors. Cost was $60 for 2 keys. I have 2 more as spares, might get them cut as well.